The enchantment that is Ireland certainly includes its wide array of flowers and flowering plants. The Irish names of these flowers hold the keys to their origin and characteristics. While not all are endemic to Ireland, many are native Irish wildflowers that came originally from the Iberian Peninsula, but are now Irish in name and in kind. “Glanrosc gaelach,” or Irish Eyebright, is native to western Ireland. Its botanical name is Euphrasia salisburgensis var. hibernica. The delicate, dual-lipped white flowers of the Irish Eyebright bloom between July and September. This plant has distinctive bronze colored leaves and spreading branches. It is a member of the Scrophulariaceae family. St. Patrick, the country's patron saint, is synonymous with Ireland but it also defines “Cabaiste an mhadra rua," otherwise known as St. Patrick’s Cabbage (Saxifraga spathularis). This perennial grows in South and West Ireland, exhibiting small flowers with pink and yellow spots on the white petals, red sepals and spoon-like leaves. These flowers are at their best from May to July. St. Patrick’s Cabbage is a member of the Saxifragaceae family. “Bainne caoin” means Irish Spurge (Euphorbia hyberna) whose bright yellow blooms flower from April to June. This perennial features stalkless, lanceolate leaves and unbranched stems. Irish Spurge grows abundantly and almost exclusively in Southwest Ireland. Bainne caoin is a member of the Euphorbiaceae family. Pretty purplish-pink, bell-shaped flowers characterize “Fraoch na haon choise” or St. Dabeoc's Heath (Daboecia cantabrica). The clustered flowers of this evergreen shrub bloom between May and October. 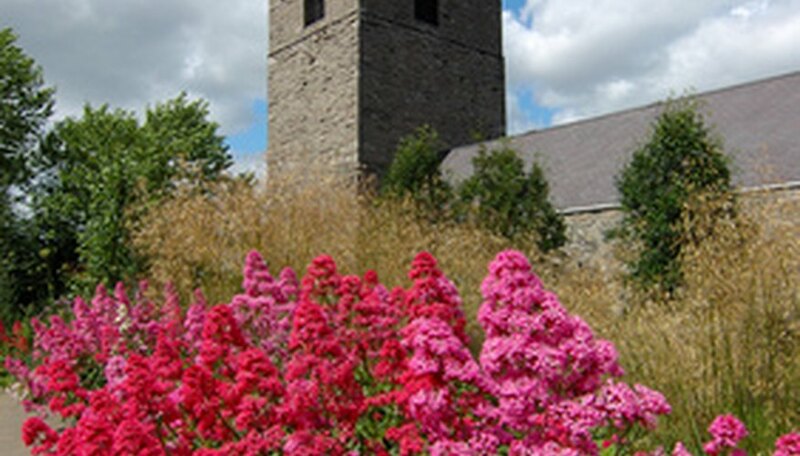 St. Dabeoc's Heath grows only in County Galway and County Mayo. It is a member of the Ericaceae family. “St. Dabeoc” likely honors St. Dabeoc of Loch Derg whose legendary history is part of the fabric of County Donegal and crosses paths with that of St. Patrick in the conversion of Ireland to Christianity. Increasingly rare is the “Magairlin glas” also known as the dense-flowered orchid (Neotinea maculata). This perennial is native to County Clare and grows in grasslands, dunes, and woodlands. The greenish-white or dull-pink blooms appear on dense spikes, usually flowering between April and June. The leaves of the dense-flowered orchid often exhibit lines of purple-brown spots. This flowering plant is not showy, but it does have a scent like vanilla. It is a member of the Orchidaceae family.